Rendering of the newest design concept of Element by Westin, which is bringing a 3-story hotel to the Sedona Vista Village in 2018. PHOENIX (June 21, 2017) – Sedona Vista Village is set to transform the faltering 90,000-square-foot Sedona Village Factory Outlets with a renovation and by adding the town’s first Westin hotel to anchor the newly purchased 9-acre development located on SR 79 in the Village of Oak Creek, known as the gateway to Sedona. The new owners of Sedona Vista Village will be demolishing a portion of the existing buildings on the north end of the property to make room for the hotel, Element by Westin. 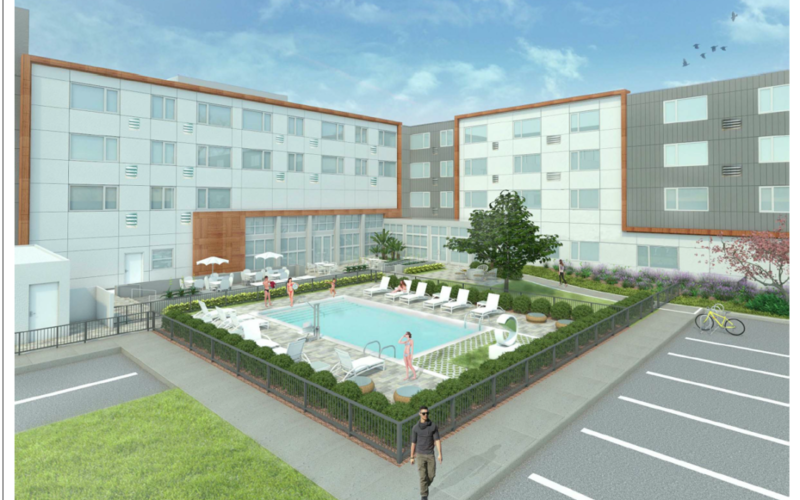 The three-story, nearly 120-room hotel, which is scheduled to open in late 2018, will include a pool, workout room and conference room. Element by Westin is the latest boutique hotel offering by Starwood Hotel & Resorts, a subsidiary of Marriott International, Inc. The rooms are designed as free-flowing space, some with kitchenettes, that can be customized by guests to meet their needs. In addition, the hotel contributes to sustainability efforts through paper recycling bins in each room, recycled materials in carpets and low VOC (volatile organic compounds) interior paints. Marty Aronson, head of Sedona Pine Tree Ventures, LLC, purchased the property in February from Oak Creek Development, LLC. A part-time Sedona resident, Aronson recognized the potential of the factory outlet location, which is one of the first retail developments visitors pass along SR 179 when traveling from the I-17 to the Village of Oak Creek and Sedona. The three existing retail buildings on the remaining 50,000 SF to the south will be renovated to complement the aesthetic of the hotel and will be available for retail use. Current tenants Famous Footwear, Tuesday Morning, L’eggs•Hanes•Bali•Playtex, and Kitchen Collective will remain. All surrounding storefront space on the south side is available immediately for lease. The chief leasing agent for Sedona Vista Village is Jack McMahon of John D. Miller Commercial Real Estate Services, Inc., in Sedona. For more information on Sedona Vista Village visit johndmiller.com, or contact McMahon at 928-224-2709 or at jack@johndmiller.com.